When you have the courage to put your art out in the world, you know you will get a mix of reactions to it in the reviews. I have never written a review (and don’t intend to start), but I’ve certainly read plenty, including many left for my audiobooks on Audible. Helpful comments include things like comparisons to TV shows and movies, where if you liked the other medium, you’d probably like this book as it has similar character development. I also like to know that the reviewer reads/listens in the genre for the review. Some people who have never read/heard a cozy mystery JUST DON’T GET IT! They think all mysteries are full of violence and fast action. They leave negative reviews and ratings for books that don’t meet that expectation. The review is also not the place to complain about the price of the book/audiobook, though many people write one for that very reason. Whether the review is left for a print edition or the audiobook, it doesn’t help anyone if it doesn’t offer constructive criticism. With an audiobook, if the Audible listener doesn’t like the story, s/he will usually trash the narrator, too, and vice versa. It’s like the reviewer is completely outraged that they spent money and then didn’t enjoy the audiobook for whatever reason. They feel it their sworn duty to warn off other people from making the same tragic mistake, yet they can’t articulate the reason the audiobook didn’t meet their expectations. 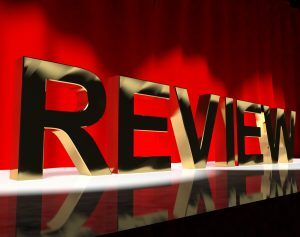 Whether a reviewer is writing from the heights of wild enthusiasm or from the abyss of negativity, what’s the point of writing a review if a person can’t say what s/he liked or didn’t like about the book? Writing “I liked/didn’t like it but don’t know why” is not a review; it’s an opinion. Even in a discussion with one’s friends, just saying “I liked or didn’t like it” wouldn’t be enough. Someone who might be interested in the book would almost certainly ask what about it did you like/not like. I’m not trying to tell anybody to write any certain thing or certain way. Even the 1-line opinions of “loved it” or “hated it” are valuable because your art made somebody feel something, which is really the point behind creating it. Since I haven’t written reviews, though, my opinions about them may not matter to anyone but me! For this reason, I am thrilled to announce a new series of interviews with audiobook bloggers! These people love audiobooks and write thoughtful reviews of the audiobooks they hear. April Holgate, prolific listener and author of the Eargasms Audiobook Reviews blog will be first in the interview hot seat. Look for her interview here on Sunday, 28 December. Coincidentally (or not! ), I’ll be interviewed on her blog that day as well and hope you will check out both of our sites. Great column, as usual, Karen! Looking forward to your posts with various reviewers.